Monster Hunter: World has slowly expanded post-release, with new monsters and armor keeping hunters on the daily grind. But as players begin to master all of the game’s hunts and its roster of monsters becomes more familiar, World needs to find new ways to bring back the wonder that made it so intoxicating to begin with. Monster Hunter: World has admirably expanded its roster over the months, adding new hunts against increasingly dangerous foes, seasonable festivals, and stylish armor. Shortly after release, it added Deviljho, a pickle-shaped dinosaur that remains one of the game’s most entertaining hunts. 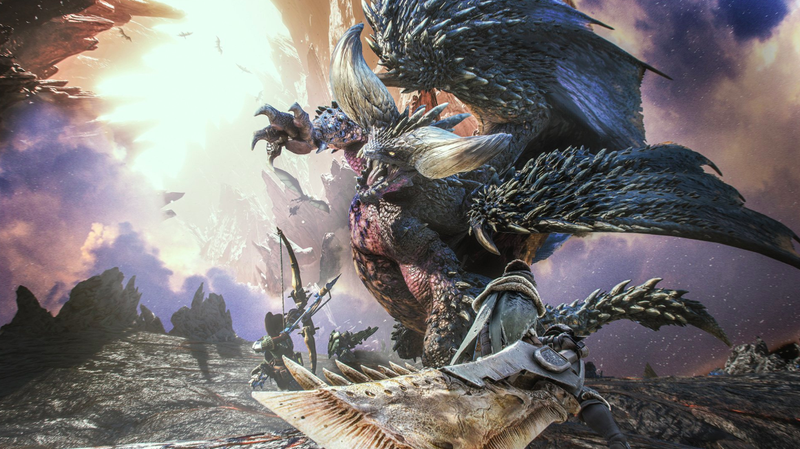 This was followed by the multi-step Kulve Taroth siege, an activity that required the cooperation of a full session of hunters to get the best rewards. The dangerous Lunastra added another difficult fight, and the mechanics-heavy Behemoth offered an MMO-style battle that was a refreshing change of pace. But these additions—alongside the implementation of tougher versions of preexisting monsters—are starting to slow down. Even casual hunters I know are reaching the point where they’ve hunted most of what the game has to offer, and while it can be thrilling to acquire new variations of older loot, I can’t shake the feeling that Monster Hunter: World’s post-game is no longer keeping up with the community’s progress. Some of this is practical. World’s developers are using a brand new engine and embracing a more realistic presentation compared to the franchise’s more anime-inspired designs. Implementing new monsters is difficult, which is why we get something like Kulve Taroth, a new monster that uses animations from the Great Jagras. Kulve compensated with its massive scale and multi-phase fight, as well as a reward system that granted random weapons. Even now, players host sessions to grind Kulve Taroth battles to earn funds and the chance for the perfect weapon. But the process can be repetitive, even by Monster Hunter standards. The Behemoth battle marked a change; its use of MMO-style mechanics, while somewhat controversial among the community, forced players to rethink their tactics. And yet, Behemoth has come and gone, and the novelty is already wearing off. This isn’t to suggest that Monster Hunter: World isn’t still enjoyable. I regularly hunt with dear friends and host streams where Kotaku readers can join in the action. Hunts are still fun in the moment, but the game lacks a certain sense of discovery. The world is knowable; the monster are quantifiable. Arch-tempered variations—high-level versions of deadly foes—sometimes add new mechanics, but they don’t always surprise. A while back, I wrote about how Monster Hunter: World could stand to be weirder, and while I acknowledge the difficulty of implementing some of the series’ more far-out designs, I do think World needs to feel wild again. It can still be a lot of fun to join a friend and hunt a Lunastra. No hunt is ever the same, and Monster Hunter: World is still a challenging game where you need to keep on your toes. But as time goes on, it’s inevitably lost some of the mystery that gave it such charm. I’m unsure of what the solution is—a new monster or a new biome?—but I do know that the most static and set in stone its world becomes, the more the game loses the spark that drew so many hunters at release.